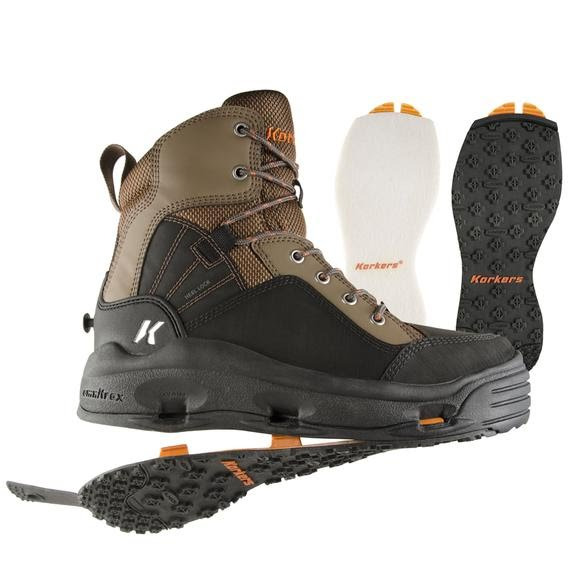 High performance and comfort combine to help you master your pursuit, the Korkers BuckSkin Wading Boots feature Korker's OmniTrax® Interchangeable Sole System that can adapt your traction to any fishing condition. High performance and comfort combine to help you master your pursuit, the Korkers BuckSkin Wading Boots feature Korker&apos;s OmniTrax® Interchangeable Sole System that can adapt your traction to any fishing condition. Vibram® IdroGrip Sole: This new proprietary Vibram/Korkers sticky rubber outsole has sharp leading edges for cutting through thick algae, wide top surfaces for gripping to rock, gusseted sidewalls for added strength, and wide easy to clean grooves between lugs. Offered exclusively with KGB style available beginning January 2013. Vibram® Studded IdroGrip Sole: This new proprietary Vibram/Korkers sticky rubber outsole has sharp leading edges for cutting through thick algae, wide top surfaces for gripping to rock, gusseted sidewalls for added strength, and wide easy to clean grooves between lugs. Incorporates 15 carbide tipped studs per foot (30 total). Offered exclusively with KGB style available beginning January 2013. Studded Kling-On Sole : High-friction tri-zonal sticky rubber excels in and out of water and reduces water absorption keeping them lightweight and reducing the spread of invasive species.